After the confusion created by the many different diseases once called lupus, nowadays in practice the term is reserved for two types, both related. Systemic lupus, which is so called because it affects internal organs, generally produces a mild rash or flush on the face. Discoid lupus on the other hand, usually causes a much more pronounced, and sometimes scarring, rash on the face and may also result in severe hair loss and scarring of the scalp. Throughout the world the butterfly has become the symbol of lupus groups and societies. 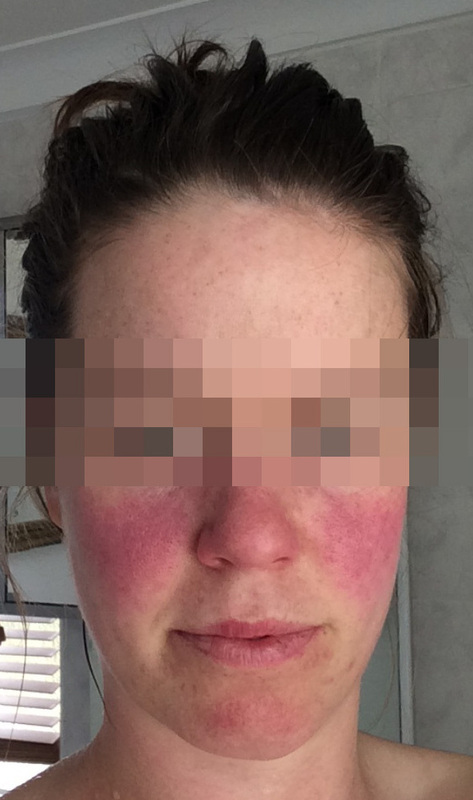 The reason is, that in some patients, a characteristic reddish rash appears over cheeks and nose, often strikingly in the shape of a butterfly. As with all 'classical' features of the disease, this rash by no means occurs in all patients, in fact probably the minority of lupus patients develop butterfly rashes. The rash varies from a mild pinkness, often brought out by ultra-violet (UV) light, to a florid lumpy and disfiguring rash, which comes and goes. It is a feature of active disease and usually disappears as the disease goes into remission. There is thickening of the skin and a scaliness, which often becomes red and 'angry'. Scalp involvement (including itchiness, redness and peeling) may be very prominent and patches of baldness may occur. Rashes may affect any part of the body, but other frequent sites are the V-neck area, the palms of the hands, under the elbows and the soles of the feet. On the elbows the rash often appears as small blisters or vesicles which come and go. Another characteristic site of these small blister-like lesions is around the tips of the fingers. Sometimes patients give histories of chilblains going back to their teens or even childhood. These small blistering lesions are associated with inflammation in tiny blood vessels. The nails are also frequently involved becoming brittle, fragile and curled. The skin patches often affect the ears especially inside the ear canal and in some patients there are mouth ulcers inside the lips. As doctors are not sure what causes lupus the reasons why lupus affects the skin are also unclear. Many cases (but not all) are made worse by ultraviolet light, which alters the DNA in the skin, making it more "allergic". Also, as with other organ involvement in lupus, the disease is often exacerbated by stress. Avoid the sun. This is the single most important step to take. The first step is to identify a good sunscreen. Our pharmacy stocks high factor sun block products and it is possible to obtain a tinted sun block to protect darker skins. Physical blocks work very well as sunscreens (containing e.g. titanium dioxide, zinc oxide) but can be opaque in appearance and thus are difficult to wear cosmetically. Remember to re-apply after swimming and throughout the day if being exposed. Sun avoidance is often essential with photosensitive skin disorders so wearing a hat and sitting out of the sun is recommended. If the skin is very sensitive, it is possible to buy screens to fix to windows in the car or home. The anti-malarial family of drugs has proved enormously useful in discoid lupus, though sometimes high doses are required. Various steroid ointments are also used. For minor defects camouflage makeup has many benefits. A small number of patients with prominent facial scarring from discoid lupus have had successful plastic surgery. Despite the severity of the skin rash discoid lupus paradoxically produces little or no internal disease. It is commonly agreed that about 5% of patients with discoid lupus develop a 'systemic' attack at some time in their lives. In contrast to classical systemic lupus (SLE) discoid disease can affect patients of all ages and frequently occurs in the late sixties. "Living with discoid lupus is a pain! When my hair is falling out I panic, when my ears are infected it is uncomfortable and sore but that is how it is. Strangers look at my arms in the changing rooms and tut; one woman said to her daughter that that lady (meaning me) must have had tattoos removed I nearly fell over! People can be so rude! It is the ignorance I find the hardest! I can't believe that people still are not aware of this disease." Mandi, lupus patient. Discoid Lupus (DLE) can affect cats and dogs, in dogs it's the second most common autoimmune illness whereas in cats it's quite rare. It seems to be found more frequently in certain breeds of dogs such as; German Shepherd, Shetland Sheepdog, Siberian Husky, Collie, Brittany Spaniel and German Shorthaired Pointer. It may strike at any age, with males and females equally affected. DLE usually affects the animals ears and face, particularly the nose (see photograph above), first signs are often loss of pigmentation, ie a black nose may become more grey in colour. Other areas of the animal such as feet can also be affected. Diagnosis is usually confirmed with a biopsy. Like with human beings, ultraviolet light can induce the disease (about half the cases start this way) and seems to make the condition worse. Vets also recognise that a virus may also be a trigger. It's more common in areas in which exposure to ultraviolet light is increased. Topical sunscreens can be very beneficial, although it's hard to get dogs to leave them on. Keeping the dog in during the peak sunlight hours is probably the most effective way to prevent excessive exposure to UV light. Treatment in most cases involves the application of topical corticosteroid preparations. Severe cases may require a systemic combination of prednisone and azathioprine, an immunosuppressive drug. Gobbolino, belonged to Professor David D'Cruz of the Louise Coote Lupus Unit, had lupus of the paw - she was treated with steroids and recovered well. Gobbolino passed away in 2008. After battling lupus she developed cancer. Millie, the pet dog of Barbara Bush & ex President George Bush, was diagnosed with discoid lupus.